Fall decorations are a favourite! We have a few humble decorations set out. This year I picked up some gourds for less than $3.00 at the grocery store for a centrepiece. Walking after supper is a favourite, especially when you get to see the salmon jumping in the river. We saw a couple make it over the waterfall this year. Planning birthday parties is another favourite. We celebrated Q's birthday last weekend and E's is coming up this month. The theme is superheroes so now it's time to think of the cake design, favours, and activities. We are loving our new backyard. I would recommend doing your landscaping at the end of the summer and into the fall. Now it is all done for next summer, and we still get to enjoy it before the snow falls. 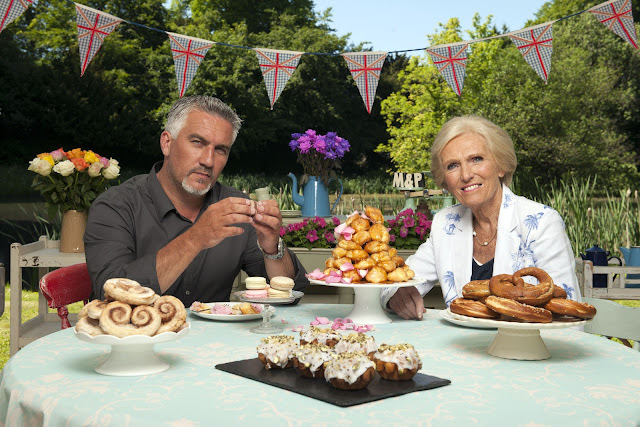 I love the Great British Bake Off!! I only started watching it halfway through this season but it is absolutely fabulous! I know they are making a Canadian version which will still be good, but it's really just the Britishness of the show that makes me so happy. I wrote about what I am thankful for yesterday. Enjoy your long weekend Canada - bring on the turkey!